A pretty interesting and intense movie that gets very dark as it goes on. 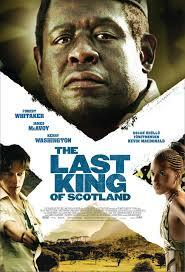 The Last King Of Scotland is a poweful and dark movie. it’s got a story that combines the fish out of water structure with the rise and fall format. that means we start with a character going into a new world, learning all the ins and outs, just as the audience learns them, and then from there it all moves on to a story of greatness and power. everything seems to be going well for the young doctor, nicholas, who is serving as the personal physican to the president of uganda. then secrets and discoveries start coming out, and the more we learn, the more terrifying it all gets. this movie really builds up in momentum as it goes on, the way that any good movie should. it’s not for everyone simply because of how brutal it gets, but it is certainly a well-made, fascinating, and intense picture. 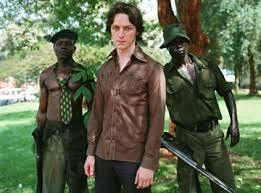 The Last King Of Scotland is a really entertaining movie. it’s a film about seeing a character change from good to bad, the more you get to know him. all of this is seen through the eyes of an outsider, whose perspective we, the audience, get to take on. that fish out of water cOncept is nothing new, but what this movie does with it is extremely cool. the movie is about a young man named nicholas garrigan,(james macavoy) who has just graduated from medical school in scotland. nicholas has no idea where he wants to live in world, but is up for some adventure, and so he spins a globe around, closes his eyes, puts his finger down, and tells himself that wherever his finger lands is where he will go. the first time he does it, he doesn’t like the place, and so gives himself a do-over. the second time he does it, he just accepts where his finger lands. the place is uganda, africa. when he arrives there, nicholas meets up with another white doctor and the man’s wife (played by gillian anderson of the x-files.) this doctor takes nicholas in and sets him up with a place to work. everyone is very friendly and down to earth, and one day there is a report that the president of uganda is coming to town to give a speech in front of a crowd. nicholas convinces sarah (anderson) to go with him, and they drive off to watch the man speak. 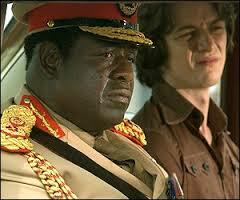 the president is idi amin, and he is played wonderfully by forest whitaker, an actor who won an oscar for this role. it was well-deserved. when nicholas first goes to hear the president speak, he is amazed by how captivating and funny the president is. this man gives it his all, to entertain the crowd and win their support. nicholas can’t understand why sarah isn’t nearly as enthusiastic as he is about the speech and what the president promises to do for the country. on their way back from hearing the speech, something happens. their car is pulled over by the president’s security team. when they get out, nicholas is asked if he is a doctor. upon replying that he is, the president gets out of the car, in need of nicholas’ help. he has been in a car accident and injured his hand and nicholas is able to treat it, right there, on the spot. in order to do this, however, he needs to deal with a noisy cow. nicholas can’t cOncentrate with the loud sounds the cow is making and asks for someone to shut the cow up. when nobody does, nicholas grabs a gun from the belt of the president, walks up to the cow, and shoots it. this is a pretty exciting scene. it’s the kind of move that really gets the president’s attention. on the one hand, the president didn’t like having his gun taken off his belt, but on the other hand, the action that nicholas made showed bravery and a willingness to do what was needed. soon, the president is sending his men out to see nicholas and to ask the boy if he will be the president’s personal physician. nicholas is so enamored with the president and with the idea that this man might be able to make a real difference, that he just can’t turn the offer down. everything seems good for a while, if you look at this movie as a rise and fall film, the first half is when everything seems to be perfect. the second half is where things fall apart. the combining of fish out of water with rise and fall is a good way to go as long as the movie can bring us into a new world that we haven’t seen before. boogie nights is another example of a movie that did it nicely. here, in The Last King Of Scotland, we get some fun scenes during the rise part of the story, like one where nicholas has to help the president after the man has combined pills with alcohal. then in another scene, the president buys nicholas a new car. things start to go sour Once nicholas tells the president something, thinking he is doing the right thing, and is surprised by the result. nicholas sees one of the president’s advisors talking with someone who he shouldn’t be, and lets the president know about it. that man is never seen or heard from again. when nicholas questions the president about it, he can tell that something happened and that it is not something the president wants to share with him. now nicholas starts to suspect that maybe this man isn’t as great as he appeared. things get much worse. nicholas becomes friendly with the different women who the president calls his wives. when he finds that the president no longer spends time with one of them, (played by kerry washington), he has an affair with this woman. when the president finds out about the affair, things get out of control. this is where the violence and grusomeness of the movie is turned up to full speed, and the horrid reality sets in for both nicholas, and for us, the audience. The Last King Of Scotland is a fascinating movie. the story is unique and i love the way that it gets extremely dark as it goes on, unafraid to show us certain things. this movie does not hold back in the later portions of its story and that makes a big difference. another film might have ended with what happened to the advisor and made that the focus of the rest of the film. this one uses that as a jumping off point to get even darker. there’s a great transformation that takes place during the course of the film, showing us the forest whitaker character in two different lights. this is a powerful and one that definitely stays with you.